a couple of years ago, i led a group of high school students to lewisham, england (just outside of london) for a two-week mission trip. it was, to say the least, an interesting experience – a group of korean-americans bringing the gospel back to post-christian england, partnered with a predominantly african/west-indian/british church. surprisingly, i enjoyed the food during our stay. we had been warned during our orientation that we might be eating lots of bland, boiled, mashed things. luckily (providentially? ), the majority of our host church members were not anglos but of west indian descent- so we enjoyed spicy jerk chicken and other west indian delicacies throughout our stay. one of the most pleasing discoveries i made while in lewisham was that, in the uk, mcdonald’s still serves fried apple pies. this brings us to the present day. lately, maybe because of all the outlawing of trans-fats, i have really been wanting to eat a fried apple pie. unfortunately, most mcdonald’s franchises here in the states switched over to the baked format years ago. it might be marginally healthier, but it is significantly less tasty. while the caramel apple empanada from taco bell is pretty good, it still isn’t quite the same. this jonesing took me to the web. 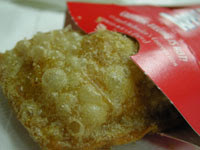 i googled “mcdonalds fried apple pie” and was delighted to find the “mcdonald’s fried apple pie locater.” seriously. after a couple of dead-ends (i started calling different locations around san diego) i finally hit the jackpot with the mcdonald’s at horton plaza in downtown sd. getting there was a whole different story. the trip downtown was relatively simple, but getting into horton plaza was very confusing. luckily (providentially? ), i found street parking right across from the mall and entered the stairwell in the parking structure. all the signs indicated i should enter the plaza at level four — but the stairwell would only take me to odd numbered floors. at my own peril (because of the apparent road rally going on inside), i crossed through the interior of the parking structure to another stairwell — which was fenced off before level four. confused, i re-entered the parking structure. i stopped a security guard to ask for directions and, happily, caught a ride with him to the entrance in the horton plaza security golf cart. after briskly walking around the floor level of the mall a couple of times, i stopped by the concierge to ask for directions to the mcdonald’s. if you’re going to visit, it’s way up on the fourth floor. and there’s no direct staircase/escalator to get there. after taking every staircase in the plaza, i finally reached the mcdonald’s. sometimes, there is a letdown after anticipating something so much and working so hard to get there. ah, but the fried apple pie is just as good as i remember it. perhaps therein lies its appeal to me — not only does it provide scalding hot fried deliciosity, but it evokes my childhood. i don’t mean to be smarmy or flippant, but this year i want to seek God in this way — earnestly, with great desire, still journeying toward the goal even if i get lost, remembering His goodness in the past and savoring His sweetness today. all of this from my fried apple pie quest.